Senate Judiciary Committee Chairman Chuck Grassley, R-Iowa, left, and Sen. Dianne Feinstein, D-Calif., center, speaks with Sen. Patrick Leahy, D-Vt., during a Senate Judiciary Committee meeting on Sept. 13, 2018, in Washington. A number of senators, including several Republicans, are calling for a possible delay in the nomination vote for U.S. Supreme Court nominee Brett Kavanaugh after a woman publicly alleged Kavanaugh sexually assaulted her when they were in high school. Christine Blasey Ford, professor at Palo Alto University in California, told the Washington Post that she feared for her life during the attack. Ford's laywer says she is willing to testify before Congress about the incident. "I thought he might inadvertently kill me," Ford told the Post in an interview published Sunday. Ford said the incident took place at a party in Maryland in the 1980s when both she and Kavanaugh were in high school. Kavanaugh has denied any wrongdoing. "I categorically and unequivocally deny this allegation," he said in a statement last week. "I did not do this back in high school or at anytime." The Senate Judiciary Committee is expected to vote on Kavanaugh's nomination on Thursday. A committee statement Sunday accused Democrats of hiding Ford's allegations until the eve of the vote. Republican Sen. Lindsey Graham, a member of the committee, said he agrees with the concerns expressed in the statement, but that he would welcome hearing from Ford if she wants to talk to the members directly. "If the the committee is to hear from Ms. Ford, it should be done immediately so the process can continue as scheduled," Graham said. 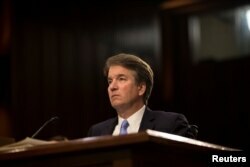 Supreme Court nominee Brett Kavanaugh testifies during the third day of his confirmation hearing before the Senate Judiciary Committee on Capitol Hill in Washington, Sept. 6, 2018. Another Republican, Sen. Lisa Murkowski, also told CNN late Sunday that the committee should consider delaying the vote. "This is not something that came up during the hearings. And if there is real substance to this, it demands a response," she said. The top Democrat on the panel, Sen. Dianne Feinstein led a number of Democrats calling for a delay in the vote. Senate Minority Leader Chuck Schumer also called for a delay in the confirmation process while Ford's allegations are investigated. "To railroad a vote now would be an insult to the women of America and the integrity of the Supreme Court," he said in a statement. Kavanaugh, 53, is a federal appeals judge in Washington. President Donald Trump nominated him in July to replace retiring Justice Anthony Kennedy on the Supreme Court.